Step back to the dawn of recorded time. Take command of a young dynasty in fertile Mesopotamia. Here, between the Tigris and Euphrates rivers, lies the cradle of civilization. Here, as the Bible tells, rose man's first cities: Ur, Nineveh, and fair Babylon. Play a part in the epic saga of the rise of these great urban centers. Guide your dynasty to develop and control the most vibrant culture in the rich land between the two rivers. Create the best balance between markets,temples, settlements, and farms. Forge your own new civilization and dominate the rich valleys of the Tigris and Euphrates. Calling Knizia the Feld of the 90s is something quite a few people will agree upon. The Doctor came up with quite a few games that are regarded as classics, and deservedly so. Thematic wise they also have lots in common, mainly lack thereof. Ra, Samurai, Through the Desert all receives complaints about being dry and theme less. While E&T also get those words there is in fact a fitting theme here. Your goal in E&T is to be part of one or more of the great Dynasties in Mesopotamia. This is done in a typical Knizia way by scoring points in 4 different categories with your worst color being the one that counts with tie breakers going to your third, second and first color. You start with 4 leaders in 4 different colors representing a King, Priest, Merchant and Farmer, 6 tiles , a couple of catastrophe tiles and a screen to hide your points and tiles. 3)	Exchange any number of tiles from behind your screen. That’s it. There really is nothing else to it. On the gameboard there is from the start set up 10 temples each with a natural colored cube on it signaling a treasure which the owner of a Merchant will be able to pick up when two kingdoms merge. This treasure is used as a joker at game end and may be added to your weakest color. Placing a leader allows you to place one of your leaders on the board with pretty much only one rule to follow. It has to be placed next to at least one temple, if at any time a leader is not next to a temple he will be expelled back to your reserves. Having a leader will allow you to score points for tiles placed in that color in that Kingdom. A King will however score points for any color as long as a leader of that color is not present so adding the King will almost always be your very first action. Tiles are also susceptible to placement as only blue tiles may be placed on the river squares. Placing a tile will allow a player with a leader of that color to earn a point which is placed behind the screen. If you get 4 tiles of the same kind filling a 2*2 square you’ll build a monument by turning these tiles over and put a chosen monument on top of them. A monument has the advantage that leaders in its two colors will score an additional point at the end of turn thus giving you more points (a King does not score points if one of the leaders is not present for monuments). The negative effect of a monument is that it weakens the Kingdom and making it more attractive for others to attack. Conflicts are a major part of any civ game and no difference in E&T, but here there are two different forms of conflict; internal conflict as in a revolution and external conflict aka a war between different nations. An internal conflict happens when two leaders of the same kind are part of one kingdom. Both players count up the temples next to the leader and may add temples from behind the screen with the attacker going first. The loser will be banished from the kingdom and the winner will receive one red point. An internal conflict usually will not happen until a monument has been built. An external conflict on the other hand can be a game changer. As kingdoms build up they will eventually grow too big for others good and at a point they will grow next to another kingdom and a war starts. Each war where the two nations combine for two leaders will do battle so up to 4 conflicts may happen whenever a war breaks out with the initiator choosing in what order they’ll be solved. Unlike internal conflicts it is not about red tiles, but instead the color of chosen conflict and each part counts the total tiles in that color and may add tiles from behind the screen. After determining the winner the loser removes their leader as well as every tile in that color from the loosing kingdom and the winner receives a point for each which quite often can be 5-10 points. After each part of the conflict has been solved you’ll have to check if there is still a conflict as tiles removed may split a kingdom into several parts and thus ending the war. A lot of people will call it dry and boring, and while it may not be oozing with theme E&T has lots in my opinion. Just consider it, you are building up one, maybe several, smallish kingdoms with a goal of proving you are the best leader. Every now and then two of these will come into conflict with each other and start a war with the result being one laid in ruins and the other either weakened or grown stronger or even both as each part of the conflict could produce a different winner. As in history planning a war/battle is often a move that is planned well in advance and in E&T this is done by discarding some tiles to get as many as possible for the upcoming conflict. No, the theme is actually strong in this one! 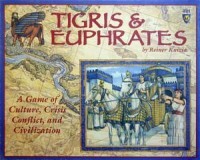 Euphrat & Tigris is one of my top two games by Knizia and is right up there with Ra. It is easy and quick to explain but dreadfully hard to master and it takes a few games to really understand how to balance everything out. Building an early monument is often the quickest way to attract attention and lose the game. Preparing this game before explaining it to my group took a whole evening, and it was a lot of fun. The trouble with grasping the rules is in the fact that there are 16 disks. 4 lions, 4 vases, 4 bulls and 4 goats, but also there are 4 blue, 4 black, 4 green and 4 red icons. Instead of normal games where you choose a color, here you choose a symbol, representing the king/leader of your dynasty (say the Vase dyn). Each color has specific meaning. By laying tiles you can get conflicts depending on the color of different clashing leaders, that get resolved and you get the spoils of war in the form of little blocks, also in 1 of 4 colors (there also jokers (yellow) that you get when connecting to edges). Instead of normal scoring, your end score is not the most blocks, but the most of the least color. Initial impression is: quite confusing, and quite complicated, let alone figuring out a sensible strategy. Setup: game takes not much space, world board is quite small-ish, and the amount of bookkeeping is also small. Downtime: there is downtime if an opponent takes too long. Long term interest: at first everyone found it beautiful and interesting, but after <10 games it was never played again. Reason is, I think, the overall 'meh' factor. Even the sensational external conflicts that laid half the board to ashes, did not appeal enough. Or perhaps it was too conflicty for a euro game. I dunno. So, just like Tzolkin, while it is a classic, and a gem to play and touch, it should not end up in your closet. Add a Review for "Tigris and the Euphrates"